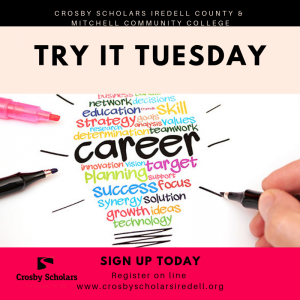 Crosby Scholars Iredell County and Mitchell Community College are hosting 3 opportunities for career exploration this summer. Rising 10th 11th & 12 graders can sign up for one or more days. There are only 20 spots available so sign up today on your Crosby Portal. Sign in to your Crosby Portal for additional information.